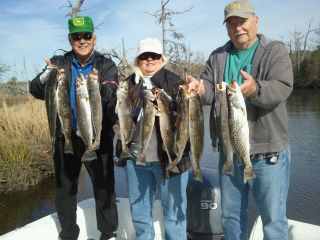 1-1-12 New Years Day Backwater Fishing w/ Rigged & Ready Charters In Holden Beach, N.C. While most people were recovering this morning from celebrating New Years, Rigged & Ready Charters was at again. Today we were on a mission, and big trout is what we were hunting. We left the dock around 7:30 am. and had a 15 mile run to where I knew the trout had been the last few days. Once we arrived it took me a good 5 minutes to thaw my hands out for I had left my gloves at the house.But no worries, we had perfect conditions, the tide was right and a cold front was on the way. Most times trout bite real good before a front. It wasnt long before we were hooked up with a good solid 23in. trout. The action wasnt fast but every fish we caught was well over the 20in. mark. We stayed in one spot and worked it real good.. We ended up with 11 Trout and to say it was good day would have been understatement. To book a trip or just to get information just give me a shout. I love to talk Fishing and better than that I love seeing and making my customers happy.